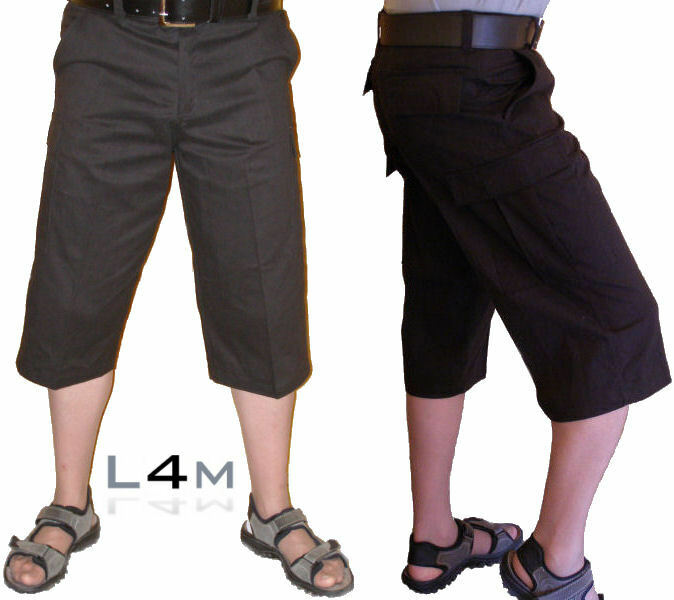 L4M 920 Capri-length Cargo Shorts [L4M 920 Men's Cargo Shorts] - £14.99 : Legwear4Men, - because men have legs too! These capri-length (i.e. below-the-knee) cargo shorts are the ideal companion for your legwear. Made from a comfortable combed cotton fabric, they have two large cargo pockets (one on each side) with velcro fastenings, in addition to the normal side pockets and two back pockets. They have standard belt loops (we stock a suitable high quality leather belt to accompany our shorts), and side adjusters. Total length from waist to bottom of leg is about 28"/71cm, inside leg is approx 18"/46cm). Please note; we can only supply this item to customers in the UK and Europe, as their weight makes it uneconomical to ship them to other destinations. Available in Black, and sizes M (32"-34" waist), L (34"-36" waist) and XL (36"-38" waist). 100% combed cotton. The photo shows the matching leather belt and Doyeah 0868's in Grey.